Shortly after sunrise on February 15, a projectile entered the atmosphere over the Ural Mountains travelling at more than eighteen kilometers per second. atmosphere. Its terminal explosion, at an altitude of twenty-three kilometers, released energy equivalent to a couple dozen Hiroshima-sized atom bombs. the shock wave reached the ground in Chelyabinsk, breaking windows and injuring about 1,500 people from flying glass and other debris. associated the event of February 15 with a nuclear attack. For this we can all breathe easier. (about 23 km) and velocity (more than 18 km/s) at peak brightness. 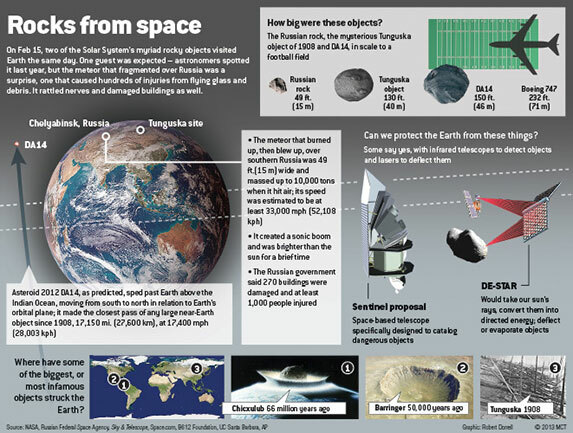 Tunguska impactor was a comet, even after most other scientists abandoned that idea in favor of a rocky asteroid. is a familiar theme to skeptics. in the far northern hemisphere over Russia. The Chelyabinsk asteroid approached from the east. pseudoscientific conspiracy theory to promote. probabilities can be estimated, and the numbers are radically different. on any given day, or 1 in 40,000.
didn’t.” By sizing a “box” specifically to just include the events in question, we radically affect the apparent coincidence of the events. two of the most destructive earthquakes in history (Indian Ocean in 2004 and Japan in 2011). correlation, might occur within a day of the event in question. explanations rather than conclude that it was no more than a curious coincidence. David Morrison is a long-time NASA senior scientist and Committee for Skeptical Inquiry fellow. He now divides his time between the SETI Institute and the NASA Lunar Science Institute. He hosts the “Ask an Astrobiologist” column at NASA’s website. Mark Boslough is an impact physicist. After a 33-year career at Sandia National Laboratories, he is now affiliated with Los Alamos National Laboratory and is also an adjunct faculty member at the University of New Mexico. He is a Fellow of the Committee for Skeptical Inquiry.